So I found myself toting an iron and mini ironing board to my lessons. This quickly became tedious and unpleasant, and so I switched to a makeshift canvas/muslin combo that was effective, but both unattractive and unwieldy. 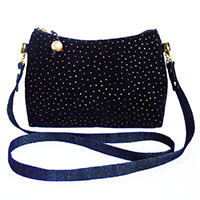 Obviously I needed something more convenient and prettier…and here we are! The truth is, I need this in my home sewing room just as much as I need it when I work with my students in their homes! My ironing board just isn’t big enough for most things I need to press; so I end up using an old towel/scrap muslin combination that is truly hideous. Now I don’t have to! If you have the type of sewing space that doubles as something else (the dining room, someone’s office, the guest room, etc. ), then maybe you’ll find this useful as well! You only need four things for this project, and you probably have three of them already! I cut my fabric 21″ x 32″, because that’s the size of my cutting table. I made the edges curved because I’m extra like that. 🙂 Make yours any size you like! The backing: I used terrycloth, but any cotton fabric would work, too. The batting: I used a layer of Insul-Bright, which is a fluffy, insulating interlining that is used for potholders and coolers and such. If you’re worried about heat or steam damage to the surface underneath your mat, you might want to use a second layer of this, or another layer of something absorbent/heat resistant between this and the backing. 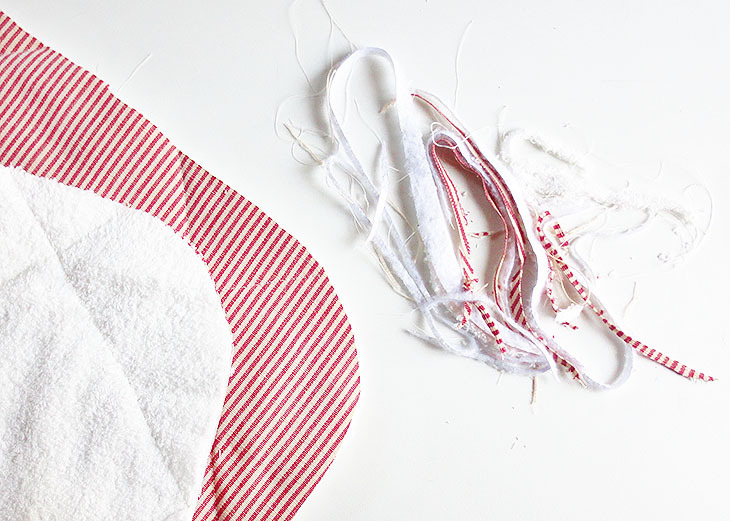 The top layer: I have this vintage red and white ticking that I adore (and that I love to paint on), which I thought would be perfect for this project. Ticking is technically “utility fabric” (most often used on mattresses and such), so it feels very appropriate for an ironing surface. Plus I just like the look of it. 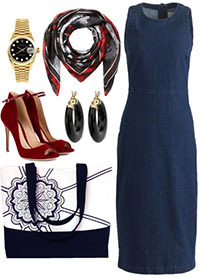 As long as you pick something 100% cotton with a smooth finish (nothing with pile or a shine to it), you’re good to go! I love me a good windowpane check, so naturally that’s the design I wanted to quilt into the pad. I do a lot of drawing on fabric, and two of my essential tools are a clear ruler and my Frixion pens/highlighters. 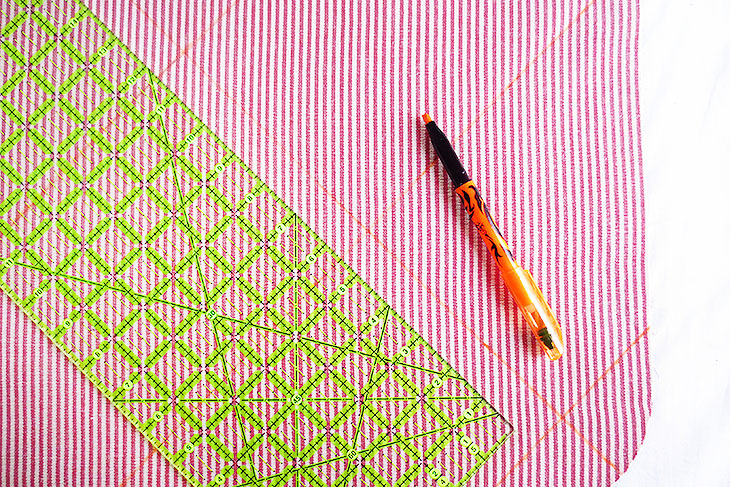 The highlighters make an excellently bright line to serve as a stitching guide, but will disappears under a hot iron when I’m done stitching. It does not matter how you quilt the layers together…you could even do just one giant stitch down the middle in each direction. But do some kind of stitching to hold all three (or more) layers together, so your interlining isn’t shifting around in there all willy-nilly. Sandwich your Insul-Bright between the ticking and the terrycloth, and spend some time making all three layers smooth and even. 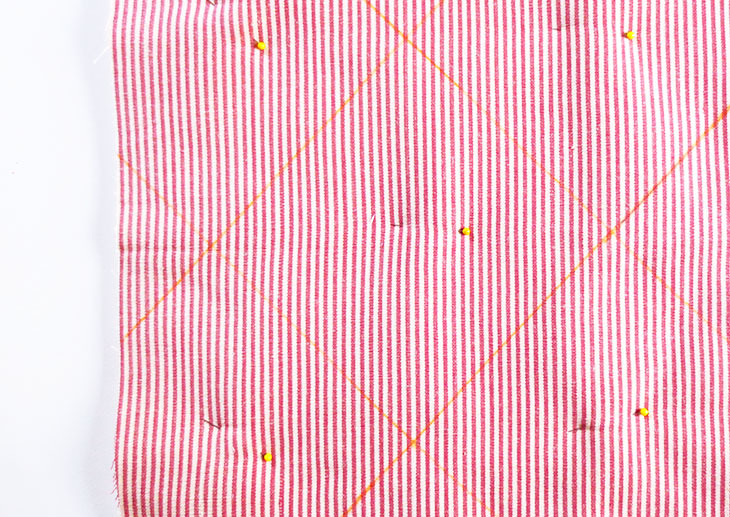 With the lines 6″ apart, it was easy and convenient to leave the pins in while I stitched on the orange lines. If you’re afraid of sticking yourself, use safety pins instead. If you want to skip the binding, only quilt your top layer and the Insul-Bright together, and leave your backing separate! You can then sew the backing onto your quilted top with right sides together, and then turn the whole thing right side out. 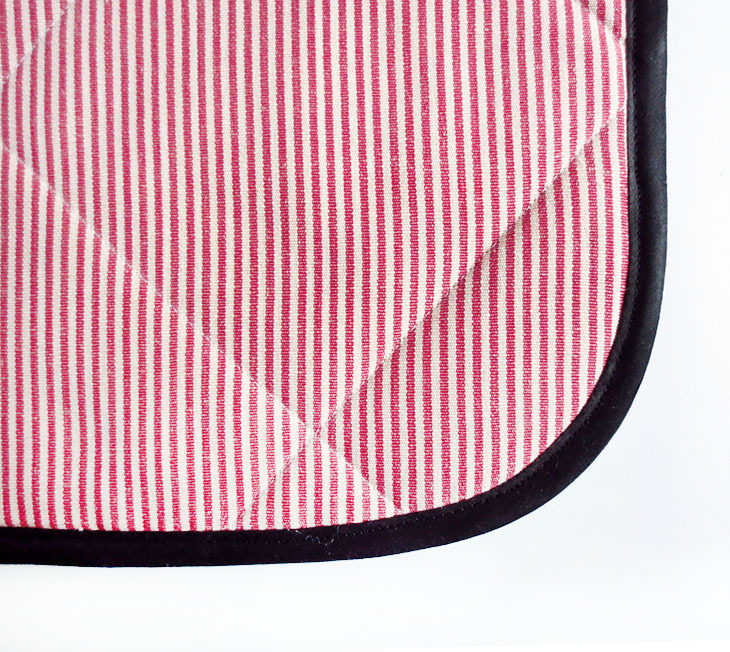 Close up the hole with a hand stitch or a simple edgestitch on the machine. Done! Once you’re done quilting (and ironing away the lines you drew), it is very likely that the edges of your fabrics will no longer meet. That is okay, we are just going to trim until they are nice and neat and matching again! Don’t worry if you have to trim both your backing (the terrycloth in my case) AND the top layer (the ticking). Just make sure all the edges are matching exactly. Next, you’ll want to baste the layers together, very close to your newly-trimmed edge. You might even find you’ll need to trim AGAIN after basting…that is totally okay. This will make the binding step much easier! 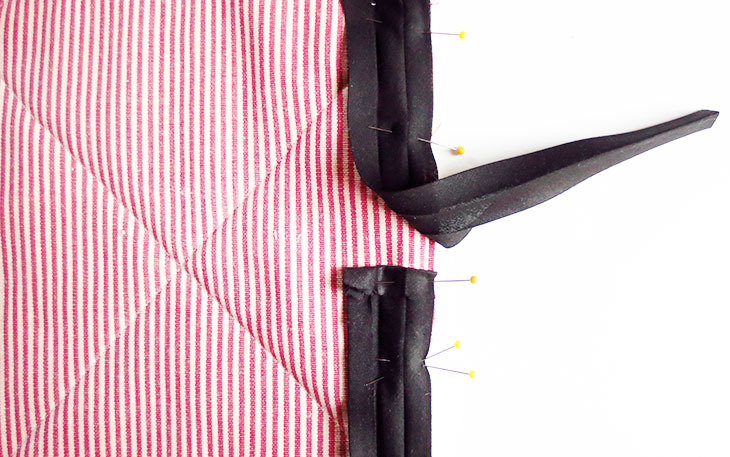 I hope you don’t cheat when you apply bias binding by just slipping the binding over the edge and topstitching…! The right way (and the easier way, honestly) is to unfold one fold of the bias tape, and pin it right sides together with the thing you are binding. Make sure the raw edges match exactly. 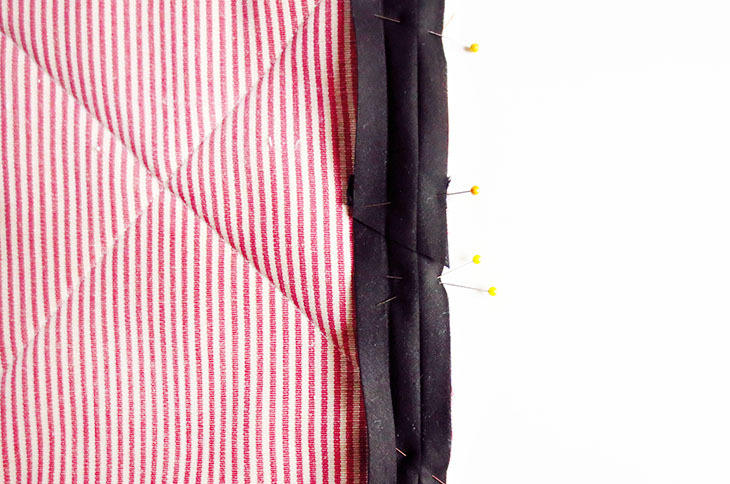 When making the ends meet, make sure you fold over the beginning spot just a bit and pin it it place. Then fold down the end on top of it. 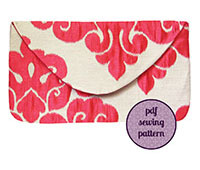 This ensures that no raw edges of the bias tape will be peeking out when you’re finished. 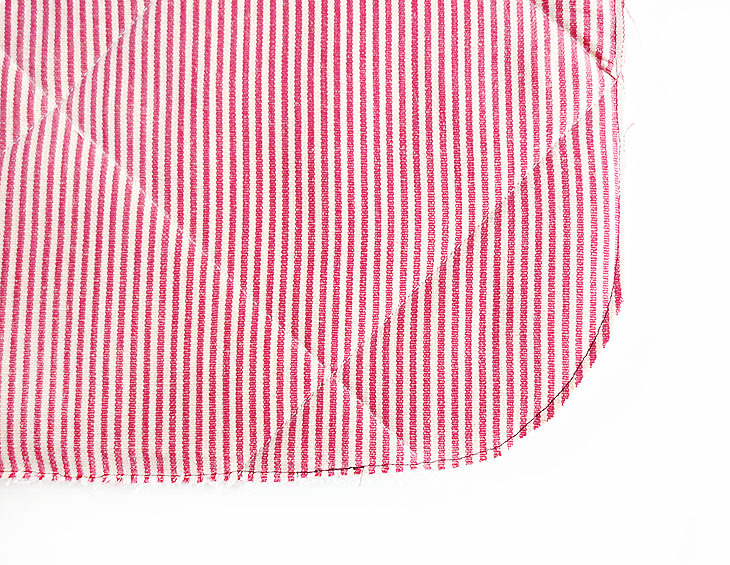 When you start sewing on your bias tape, you will stitch directly into that first crease…it is usually about 3/8″ from the edge, sometimes as much as 1/2″. DO NOT start where the ends of the bias tape overlap, but rather slightly below that spot…where I have the double pins in an “X” shape in the image above. Why? 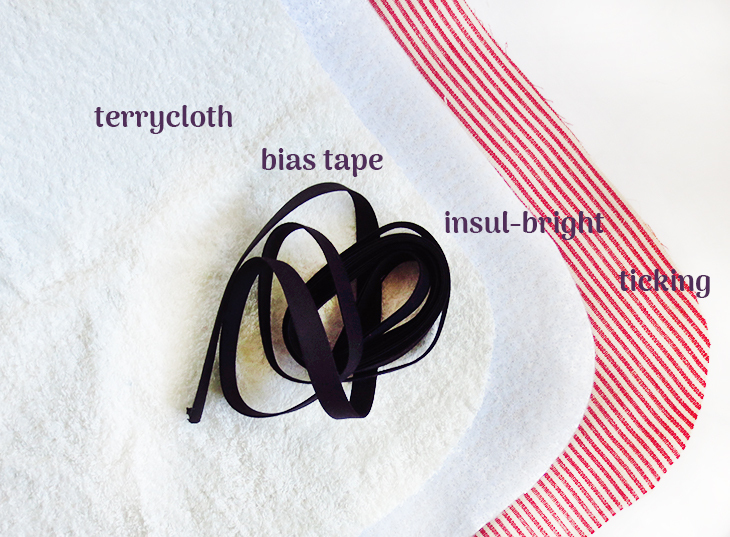 Bias tape can very easily stretch as you sew (regardless of the shape or size of the thing you’re sewing it on to). If that happens, you will want to be able to adjust the tape at the end, to eliminate any bulges or buckles that may have appeared along the way. Once you’ve stitched down the bias tape, you will wrap it around to enclose the raw edge of the pad, and pin the other fold to the back of the pad. You might have to fiddle with it if your pad is very thick (I used very thick terrycloth so mine took some wrangling). Then, you’ll want to topstitch the bias tape in place from the front, making sure that your stitch catches the fold of the bias tape on the back. While I’m pinning the bias tape for this last step, I like to test it as I go, using a pin to imitate what my machine needle will do, making sure the pin goes through the fold of the bias tape on the back. And you’re done! 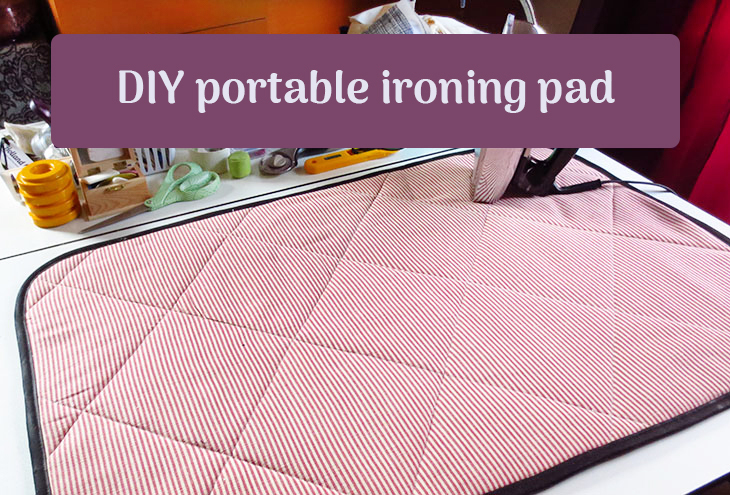 Now you have an easily portable ironing pad you can use anywhere in your sewing studio, whether you have to pack up your sewing gear after every project or not. 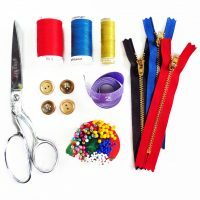 Having the right tools always makes sewing easier and more fun!